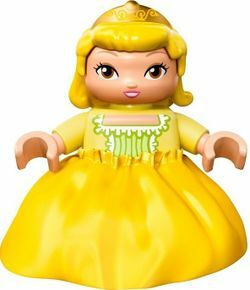 Amber is a Sofia the First DUPLO Figure released in 2015. She is currently exclusive to 10595 Sofia the First Royal Castle . Amber has medium length bright yellow hair and in it she wears a golden tiara. Amber has light nougat skin, her head is rounded. She has brown eyes, a small round nose, and a smile decorated with lipstick. Her torso is cool yellow and so are her arms. Amber's torso has olive green and white lacy decorating on the centre of it. Amber's hands are light nougat. Her legs are cool yellow also, and over them she wears a yellow dress. This page was last edited on 12 April 2016, at 16:52.